In contemporary life, we are connected constantly, but not all the time in the same way. Our day have turned into a digital day. Channel is a concept often used when talking about reaching clients. A channel is an means to transmit data and information. Channels typically are connected to a platform of some sort. The newspaper is a channel. The television is a channel. The tablet is a channel. but are they really? How can the tablet be considered a channel if the newspaper is also a channel, since the newspaper is made available on paper, on the desktop computer and on the tablet. Or is the paper version of the newspaper a different channel compared to the digital version? As a reader, this is not how we expect them to work. We expect that if I start reading an article in the printed version, I can continue reading the same article on my smartphone, should the situation call for it. The concept of channels, as information channel towards a (potential) client, may shift away further from the actual tool or technology used to establish the data and information connection, and become a specific aggregation of tools and technologies through which the target segment can be characterised. At the moment, a channels’ definition is linked to the technology used. We refer to a channel as a single technological infrastructure, such as for example a tablet computer or a smart phone. Wikipedia explains; Historically, communicating data from one location to another requires some form of pathway or medium. These pathways, called communication channels, use two types of media: cable (twisted-pair wire, cable, and fiber-optic cable) and broadcast (microwave, satellite, radio, and infrared). Cable or wire line media use physical wires of cables to transmit data and information. Twisted-pair wire and coaxial cables are made of copper, and fiber-optic cable is made of glass. Nowadays, in information theory, a channel refers to a theoretical channel model with certain error characteristics. In this more general view, a storage device is also a kind of channel, which can be sent to (written) and received from (read), like for example a smart phone. The way we use technology, this traditional definition of channel as technological platform does to suffice. In former times, people were either watching the television, or reading a book or listening to the radian. That where the simple times. To communicate to your target segment you had to select a (technology) platform, and maybe a time frame (e.g. run the advertisement in the morning or in the early afternoon? On sunday maybe?). Reaching your target segment meant pushing the information or message through the selected channel, i.e. platform. Placing an add on the television. Running an interview won the radio etc. In current times, we have the i-family of products that we use imexchangably, and worse, sometimes all at the same time. At the moment I am writing this on a laptop while following twitter on my smartphone. In half an hour I will be on the train home, and probably first browse my mail on my tablet. Reaching your target segments in current times means sending the same message via different platforms that your target customers are using. A channel used to be a single platform, but tends to grow into a specific constellation of platforms that are used by the target segment in combination to basically perform the same activities. 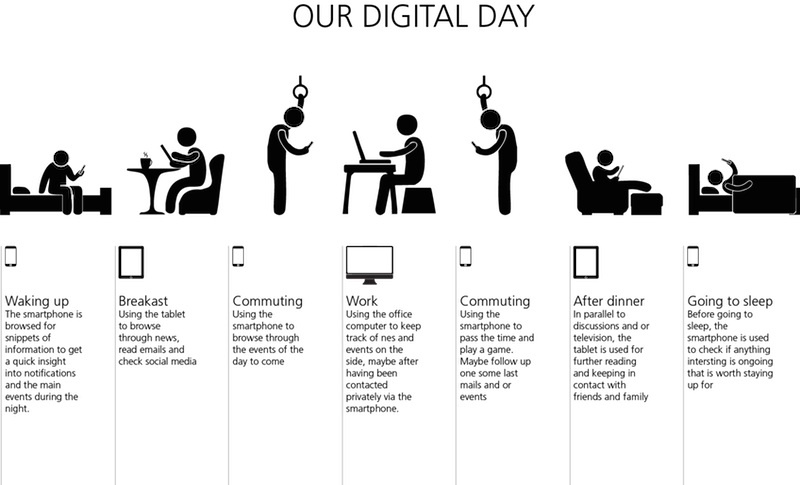 This is illustrated with the image above; Nowadays,we are are connected throughout the day with the same source of information, but depending on the time of day and on the kind of activity, the platform and tool used to access this information differs even if our activities are the same or guided by the same interest. Take Jack for example. Jack lives in the city and commutes to work by tram. When he wakes up he first glances over our smartphone to check latest messages and news snippets. During breakfast he reads the news on a tablet. Commuting to work he again browses his smartphone, while at work it is his (desktop) PC that rules. Commuting back home he plays a game on his smartphone, and in the evening he watches a movie while chatting with friends and liking Facebook posts on his tablet. Then just before going to sleep, he glance a last time over his walls on his smartphone. The point is that in order to reach Jack, in order to get his attention, it is not sufficient to address a single platform. To reach Jack, we need to send small notes or ramified information to his smartphone, maybe full texts with multi media to his tablet, and again small notes to his desktop (since this goes in parallel to ‘working’). The channel to Jack in fact consist of a smartphone, a tablet and a desktop pc. Now, maybe you are not Jack, maybe you are more like Peter. Peter has a smartphone and spends his time commuting reading the newspaper he subscribed too, on his tablet. The channel to reach Peter is different, not only the platforms it consist of, but also the manner in which Peter interacts with them, and probably also the amount of time spent on them. ‘channels’, as connections to transmit information and data, have grown into an aggregation of platforms that function in full symbiose, based on the behaviour of the target segment. In reaching this target segment we need to identify the platforms the channel is constructed from. redefining what are channels, forces us to re-think how we reach our target segment, and invites us to move away from pushing data over individual platforms towards orchestrating information over various platforms in with the purpose of becoming more effective in informing and reaching the target segment throughout our digital and ’always connected’ day.